I'll be candid. I cannot, for the life of me, hold down any kind of vegetable without immediately feeling an insatiable need to hurl it right back up. The same holds true for all things carbonated, which means absolutely no soda for me ( believe me, that's more than likely a good thing). I've also managed to keep my affinity for various assorted processed junk foods reasonably in check, and, guess what - I'm still 172 cm tall and 61 kilos light. * But enough of that tangent. Synopsis: This deck abuses Sprouting Phytohydra's spawning ability by using it with AEther Flash and toughness boosters to reap infinite hydra tokens. Once the combo gets rolling, you can fling your tokens at your opponent by using Blasting Station, which conveniently untaps every time a new token hits the board. Since Sprouting Phytohydra has only 2 toughness, you'll need to have either Gaea's Anthem or Primal Forcemage in play (making sure to stack his CitP trigger above AEther Flash;'s). If you want to go the budget route without resorting to splashing for white, you can use Sword of the Paruns instead of Anthem, though the latter is vastly superior in virtually every situation, and is a good investment by itself. There are a variety of support cards present here. Harmonize gives you crucial card advantage in a color where hardly any is to be found. 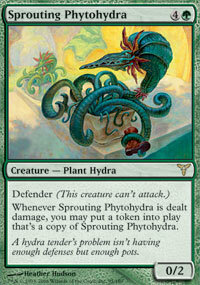 Worldly Tutor acts as Sprouting Phytohydras number 5-8, though it can also fetch up a Primal Forcemage if necessary. Incinerate is quality spot removal, though if you want to make the deck extended-legal you can replace them with Shock or something else along those lines. Sakura-Tribe Elder and Yavimaya Dryad help set up your mana base while doubling as much-needed defense at the same time. Playing Tips: As for playing the deck, you want to play as many support creatures as you can before you play AEther Flash. If your opponent is about to run you over with one and two-toughness weenies, then by all means, slap it down. After you have the Flash in play, you'll need to get Gaea's Anthem out, assuming you don't have a Forcemage in play already. If you used Worldly Tutor to get a Phytohydra in hand, then your opponent will probably realize what is coming and will try and stop you by any means possible, so be wary of any combat trickery. If your opponent has instant speed removal and tries to take out your Phytohydra the instant it comes into play (so that Flash never hits it), you can still save it, assuming you have a filler creature out. Just sacrifice the other creature and have your Blasting Station hit the Phytohydra - you'll lose the original, but the combo can continue on. Paths Not Taken: There are several alternatives you could use with this deck. One would be Pandemonium. The reason I dislike the card, however, is that often times your own creatures will end up in the heap before you can even start to go off. However, you would not need AEther Flash to go off, since you could use your Blasting Station on your own Phytohydras to create infinite tokens. If you really wanted to, you could add white for cheaper toughness boosters like Veteran Armorer. You would need expensive duals, however, to ensure some measure of consistency. If you really feel like dropping the big kaboozles, Goblin Sharpshooter can replace both Blasting Station and Gaea's Anthem/Primal Forcemage and produce the same results, reducing the four-card combo to three. ...and break it I did. The result - " , Sacrifice a creature: Search your library for any number of basic land cards and put them into play tapped. Then shuffle your library." Synopsis: This particular deck abuses a tricky three-part combo - Seed the Land + Stone-Seeder Hierophant + Perilous Forays. Here's how it works: with all three cards in play, you sacrifice an extra creature to Perilous Forays. 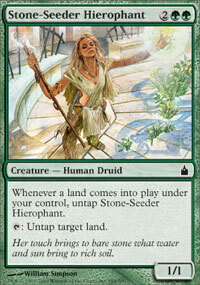 Then you untap the land you just tapped to pay for the Forays with Stone-Seeder Hierophant. When Forays resolves, you get a Forest in play tapped, which triggers Seed the Land and untaps your Stone Seeder. 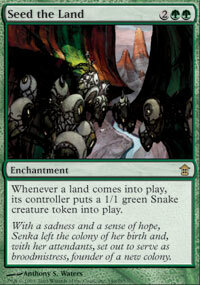 Now you have the same land untapped, and you have a 1/1 Snake token in play. Thus, you may lather, rinse, and repeat - sacrifice the Snake token, tap the Stone-Seeder to untap the land, get another land, put another Snake token into play, untap Stone-Seeder. Do this until your deck is completely free of lands. Now what do you do with all that land? If you had some Vinelasher Kudzus in play, they suddenly got a whoooooole lot bigger. If you had a Blanchwood Armor enchanted on a creature, that creature just got a whoooooole lot bigger. If you have an Unyaro Bees in play, you can suddenly make it a whoooooole lot bigger. If you have a Wurmcalling in hand, those wurm tokens just got a whoooooole lot bigger. So yeah, uh, bigger is definitely a whoooooole lot better. There's one more interesting card here, and that's Fecundity. It's completely optional, but if you have it in play when you go off, it basically gives you a massive card draw. There's a lone copy of Spellbook - if you happen to draw it, you won't need to discard four-fifths of your newly-won hand. Of course, Fecundity benefits your opponent too, so use it with discretion. Of the other cards, Llanowar Elves provides some quick acceleration, and Yavimaya Dryad makes for a good Blanchwood Armor target. That's pretty much it for the support staff, as the rest of the deck is pretty focused on the combo itself. Playing Tips: This is a very fun deck to play - as long as you play it correctly. The combo itself takes awhile to go off, and you could always screw up somehow (yes, it happens to me, too), so be careful of when and where you are clicking. You definitely want to get your early acceleration down quickly, so you can go off with minimal chances of being disrupted. Play your Vinelasher Kudzu's *before* you go off, or else they'll essentially be 1/1's for the rest of the game. If you have all your pieces in hand, play the Stone-Seeder Hierophant first, so you can tap out the next turn without summoning sickness affecting it. As I stated before, definitely be careful with Fecundity, and if you feel like you don't need it to win, then by all means, don't play it. Paths Not Taken: I went for a very general "get yer mana out an' rip 'em" type of deck. It's possible to turn this into a big mana engine, though. Just enchant cards like Dawn's Reflection onto the land you untap with the Stone Seeder to gain an exorbitant amount of mana and plug in Blaze for the win. There are other cards that could have been used, like Baru, Fist of Krosa, Budoka Gardener, or Allosaurus Rider. You could also have gone for the man-land strategy, using Kamahl, Fist of Krosa or Natural Affinity. There are countless ways you could go about with this deck. I hoped you all enjoyed this article. So then, until next time, good luck, and have fun! The deck called Sow the Seeds seems a lot of fun to play. A great idea. By the way Budoka Gardener seems to be a nice addition to that deck. Perhaps you could replace the Yavimaya Dryads with the Gardener and create huge Elementals with it then. Just a thought. Good work on breaking the Heirophant. I tried to abuse him as a flanker deck in Emperor once (New frontiers and a fully enchanted emp land? good times) but never got round to doing truly fun stuff with him.